To be successful in trading, one of your hats has to be a “Contrarian Hat.” When everyone else (the herd) is in a trade and positive it’s going to continue, it’s time for you to look for a trend change. When the movement of an asset (eg – the US Dollar) starts to produce major mainstream news stories, you know a trend change is imminent. The US Dollar has been all over the media this past week; the trend is all but over. The herd registers extreme sentiment in one direction near the end of a trend. In other words, extreme mass sentiment of this nature is usually due to “everyone” being fully invested in the current trend. Volume starts to dry up, because there are few others left out there who aren’t already committed (both financially and psychologically). We’re seeing historical off-the-charts extremes. The last few days of this week, we’ve seen a negative NYSE advance/decline ratio even as US equities rose to extreme new highs. The FANGs (Facebook, Amazon, Netflix, and Google/Alphabet) are the major stocks behind what’s left of this rally—market breadth is very low. Along with the sentiment reading his suggests a turn is imminent. Also note that the VIX levels have been abnormally high in the final stages of this rally. This non-confirmation is typical of the final stages of a trend. The VIXX has also turned up very recently, also telegraphing a change in trend is likely nearby. Let’s look at an update of the US Dollar. Last weekend, I wrote here that I was expecting a small yellow wave 4 and then a new low in a wave 5. We now have that pattern in place, but it doesn’t look quite complete yet, although very close. I’m expecting one more smaller degree fourth wave now (up) and a final fifth wave to conclude this trend, culminating in a turn up and leading eventually to a new high above 26.82 for UPP and a similar new high for the US Dollar. The dotted fibonacci line at about 23.00 could be the final target for a turn. DAX has potentially topped and tracing out an impulsive sequence to the downside. Some USD currency pairs appear to have changed trend, while others are working on a turn. Oil is looking “toppy.” Gold and silver are heading down with USDJPY. The VIX has also foreshadowing trouble on the horizon. Even the VIXX is showing signs of a trend change. We’re almost all set—we just need the trigger for the US indices. The trigger is the turn of the US Dollar. There was a period in August 2016 where the US market looked like it was heading for a top. I never did call a top, however. You can’t call a top until you have a first impulsive wave down to a previous 4th wave, a second wave up to at least 62% of the drop and then a new low after that. We haven’t had that sequence, so I haven’t called a top. You’ll know when I call a top … lol. Once the SP500 went to a new high in 2016 (just that one index), it was clear we weren’t going to top at that point, and I proclaimed that we were going to continue heading up. It was an immediate call because EW is very clear at certain points. Once one index provides a technical breach of a key level, its buddies will follow. This wave up from 2009 is a B wave, a corrective wave. It’s not supposed to be possible, based on Prechter’s book, which flies in the face of what Elliott believed. I wrote about this in my blog a few weeks ago. I’m one of the only ones that believes we’re in a corrective B wave, which is notoriously hard to predict, because there are few to no rules. They end after 5 waves, but will appear to be in 3 waves. The subwaves are often all over the place and fibonacci ratios are often not hit (contrary to what happens in impulsive waves). EW is price cycles; it has an extremely weak timing element. So, due to the weak timing cycle, you have to follow EW until you see the final fifth of fifth of fifth (these levels due to the fractal nature of the market). So, while Bob Prechter (EW’s iconic promoter) has called a top several times, I won’t until I see the pattern I’ve outlined above. It might be late for some, but it will be a “firm” call. This weekend, we have the US indices finishing the fifth etc wave. Several major stocks have already topped and are in the midst of tracing out the pattern I described above. DAX has topped unofficially, along with TSLA, and AAPL and others. However, I won’t “call” a top in the US market until I’ve seen the above pattern, because it’s unsafe to short until that pattern has unfolded. People say I’ve called a top. I have not. I’ve been saying we’re topping, but I also say topping is a process. The US indices are part of a much larger picture. They are one asset class of a worldwide topping process. I expect the US indices to top this week. The signs are all over the place, but the key is the US Dollar. 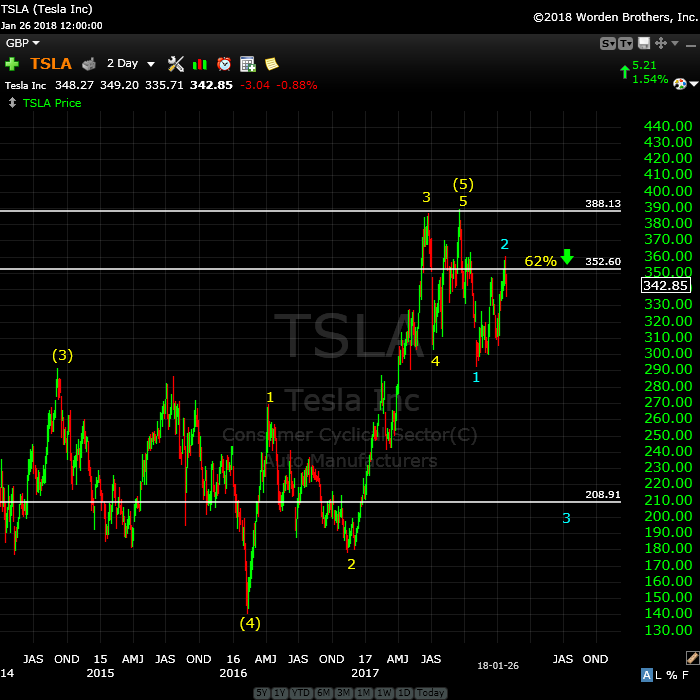 Above is the 2 day chart of Tesla, showing my prediction playing out. The top is not officially in here; we need a new low below ~290.00. Last week, I suggested we’d head up in a “double-pronged” second wave, which is exactly what we’ve done. We’ve now potentially turned down into a third wave with a target in the 209 area. After hitting that target, we’ll require fourth wave bounce and then a final fifth wave drop to a new low near the 130 area. 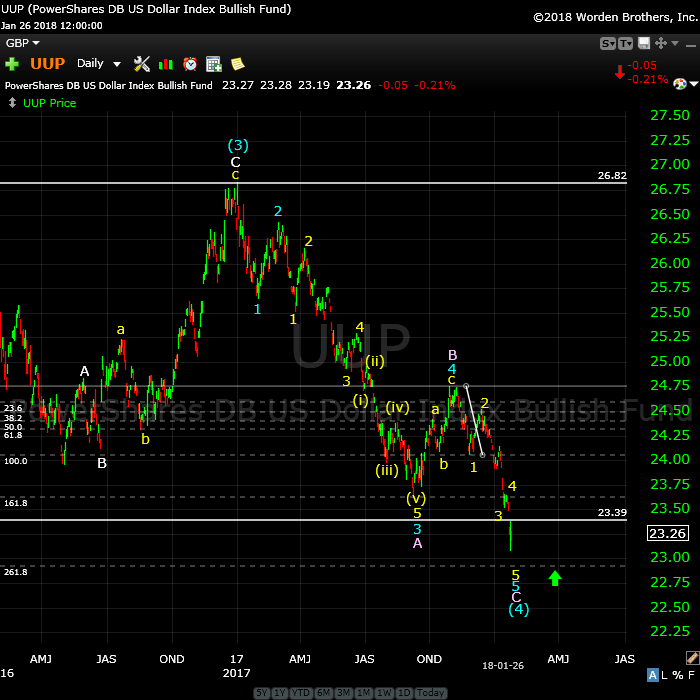 There are potential variations to this pattern, but the ultiamate goal for a first wave down should be below 140.00. Less Expensive iPhones on the Way? Above is the 2 hour chart of AAPL. Two weeks ago, I predicted a small rise to a final high, which is what happened. It was followed by a turn down. Now we have what appears to be three waves down in place. Note that the third wave as shown is a fibonacci length of 1.618 X the first wave. I’m expecting a fourth wave bounce and then a large 5th wave down to the 148.00 area. Ending diagonals always revert back to the start of the ending diagonal, which is the previous 4th wave area (~148.00). 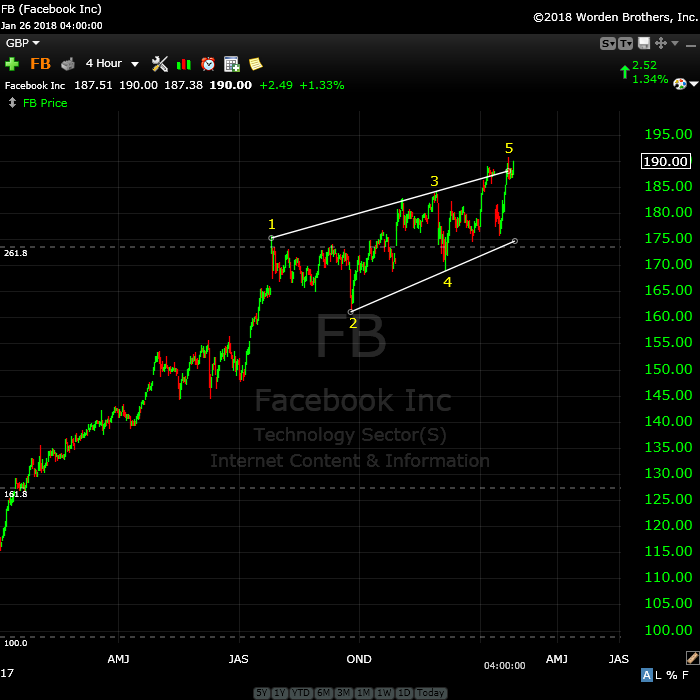 Above is the 4 hour chart of Facebook (one of the FANG stocks). This shows the final pattern I described last weekend, which is an ending diagonal. Ending diagonals gained that name because they form at the end of a trend. You can short a pattern like this when it drops below the lower trendline. There will be a lot fewer people posting “look at me!” stories in the coming years … somewhat of an understatement, I think. But again, the key to shorting these “whales” is to wait for a complete first and second wave scenario to play out. On Friday of this past week, I removed the ability of “transients” to leave a comment without registering. It also means that the information of commenters won’t show up in the fields at the bottom of the blog … because the fields are no longer there! After several weeks of exhaustive sleuthing and some fair expense, Bluehost (the hosting service I use for this site) finally admitted that there’s a bug on their server. I’ve had two well-know WordPress development companies go right through my site and both came back with a caching problem diagnosis, and that it was not an issue with the site itself. However, I have to wait (usually up to 72 hours) for them to hunt it down and fix it. Hopefully, that will end the frustrating issue with posting comments. I don’t actually know that to be the case, but we’ve about run out of options. And these developers I’m working with know WordPress inside out. There have been no material changes to my prognosis. We are at the high. I expect this final wave to turn down imminently. Another frustrating week as the US Dollar tries to find its bottom. As a result, the US indices have inched a little bit higher in yet another extended subwave of the 5th wave. The underlying technical indicators however, don't support an extended rise. Volume: It's risen slightly. 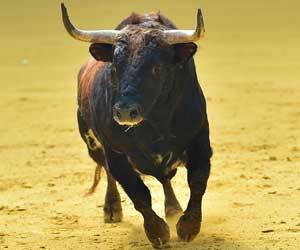 Bullish sentiment is EXTREME. VERNE – i must protest ………..”MOST” strongly! !……this is unacceptable! now …………………………. can i have some peanut butter on that ice cream??? put your hands in the air……………..slowly……………………..and drop the weapon……………………..! the “drain off” of the Fed balance sheet……………..was back loaded also so that in this first week of Feb [due to uneven redemptions schedules] 50 billion is scheduled for “drainage”………………. ahhhhhhhhhhhhhhhhhhhhh……. smell the mountain “coffee” verne…..but leave the flag! we be…..busted through the lower trend line!!! AAPL with 5 down now. its after 2 pm……………………………..that means only one thing…………. for the public record………………………………. i loved the acting of Anne Nicole Smith! And another thing; Although scantly (note, I did NOT say “scantily”; we will leave the matter of the adequacy of the FED’s attire for another discussion!) referred to, a plethora of Hindenburg Omens remain on the clock…what’s not to be bullish about… hmmnnn? look at my “potential” w3 target …………….. It may well be that they have decided that the sheeple are already plenty plump! After all, the optimism WAS historic was it not? After all, the Nanny FED have always rushed to rescue so why would they not once again? Here is the problem people. A close of VIX above 15 today WILL result in margin calls for the hapless crowd in the short and synthetic short vol co-hort, and those will most certainly go out over the week-end. The leveraged longs had better hope the market Nannies show up…. W(4) and W(5) of 5 of the 1st wave still left to go..
How long d’ya think it will take, for the sheeple to awake? So far as I am concerned, VIX says…GAME OVER!! there is a very real potential that w3 still has a way to run. at this point i would post a chart………..but “investors.com” site platform from whence i chart has the site closed down for maintanence ………….grrrr…………. Yep. No real divergence today. Still, I would be surprised, (not my preference) if we don’t see some kind of rally next week. A bounce back to today’s gap area would be oh so delightful…! Well, for the way I plan on trading this beast I am going to need some precision EW counting. See y’all at the chart show next Thursday. Closed a couple ten baggers today but now I am out for BLOOD…d’ya hear???!!! Monday we should hit the 2751 mark and turn up for wave 2. Maybe we gap down Monday then reverse until Thursday. I will wait to see your chart.. I am always open to new ideas. Looking forward to seeing luri’s charts as well. The new high in VIX does suggest wave three down might still be unfolding. VIX does tend to spike to a LOWER high on completion of the fifth wave of an impulse as it sports a long upper wick. I am not sure who you’re referring to ( not Joe though). This wasn’t a real puetz crash window due to the lack of a preceding solar eclipse, which ties into what Joe has said. However we got a decent sell off post the full moon perigee eclipse. Interesting. I was going to ask about the Puetz window, as I didn’t think it was, either, but I haven’t had time to check. That said, if you are bullish and advertise your stance to your audience, I feel it is important to communicate caution especially when S&P500 is 3 standard deviations above the 200 dma. I feel it is responsible to ask them to take profits and adjust portfolio accordingly if it is too heavily weighted in equities. Not all your audience can afford a drawdown that can last for months especially when they just piled in the last 2 weeks. The level of exuberance matched the sentiment for BTC from 11/25/17 to 1/6/2018. Yes, I know the BTC top was 12/17/2017 but late HODLers didn’t realize it was the top and probably were dollar cost averaging as it went down. So how many “post full moon perigee eclipse” caused the DOW to drop 666 points? If you don’t want to call it a puetz crash then we can then probably call it a super blue blood moon crash. Bottom line, a “crash window” was given as a hypo to warn new buyers from entering a swing high period. Ps – Thanks for fixing the sign in bug Peter. It’s not quite fixed yet but will be this weekend when I moved the site to another web provider. Bluehost has turned out to be a joke and won’t do anything about the bug on their server. It’s a pretty sad state when this kind of stuff happens, but it’s not surprising, I suppose, in the world we live in. I wish you all the best Kerry. Investing and trading styles certainly differ I have no doubt many will remain fully invested long after this market turns and others will continue the merry dip buying…right up the bitter end. It is after all human nature to learn nothing from the past, therefore endlessly repeating it. Nothing new under the Sun! Markets fall much more swiftly than they rise and so if focus on the former events. I am quite content to patiently wait for a precise opportunities to make ten baggers on options on ES futures and five baggers on cash session trades than keep hard-earned capital in an overbought market in a time of historic sentiment extremes. I believe the turn is in and we are in W(1) to the downside. I will know more this week as the waves unfold. Bulls will have 1 last chance to exit on the Wave 2 Bounce but that will be it. We all know what happens after Wave 2. If the Bulls want to deny and not except the market does not go just up and risk their entire account then that is their business and they might as well kiss their account goodbye. Look at a SPX weekly chart.. It is straight up. Anyone that has traded for any length of time know exactly what happens once it turns.. It crashes hard, because it is a blow off wave. Ok so if your Bullish and can’t understand the market goes the other way too, Why would you not move to cash and see what happens? Bulls make money Bears make money Pigs get slaughtered. With the straight up move bulls will take their profit and bears will start to profit on the way down while the rest will get slaughtered. The market comes down way faster than it goes up. Let Friday be a lesson to you. Like I said on this next pop up will be your last chance to get out or get prepared for the butcher! Hi Jody. I tend to agree with your bearish take. I can also count a five, triangle, possible five underway for an abc down. 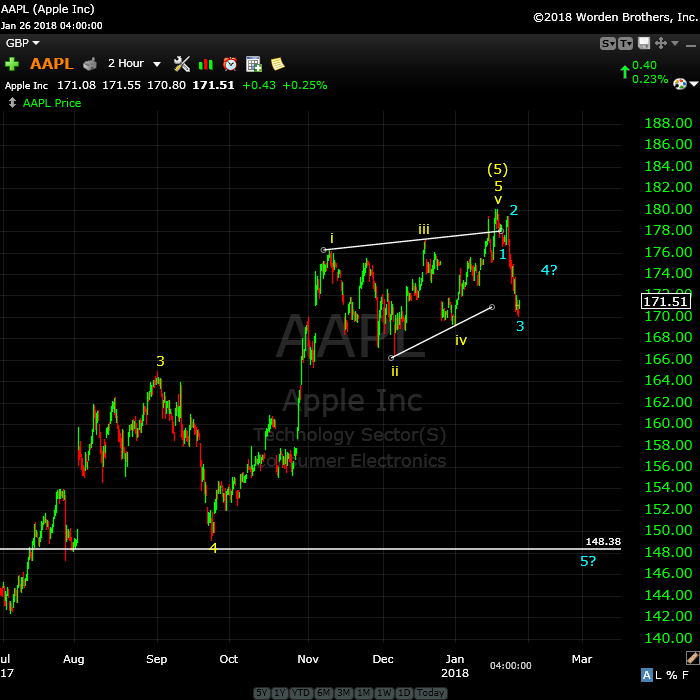 In addition to a massive trend change, it could also be just the A wave of a larger corrective decline. I am intetested in what indicators you use to help you distinguish ABCs from 1,2,3 early. Thanks! C waves are usually 1 – 1.618% of the A wave. The 3 wave was 2.618 of the 1st wave followed by a .32 retrace for wave 4 and now we are in wave 5 that is about done. SPX 2751 is the target I have right now. We could of course retrace .62% then drop for a wave 3 that could in fact be a C for a larger 4. The retrace of that wave and how it is structured for me will confirm for 100% a top is in. 1-2-3 can be A-B-C but this structure down at this point looks motive. have previously characterized SVXY as the ‘market tell’…SVXY “Does not track the performance of the CBOE Volatility Index (VIX) and can be expected to perform very differently from the VIX”…it is well worth monitoring! 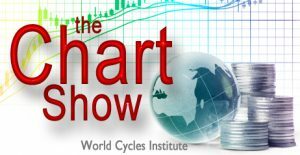 in early January 2018 the Fed released their 2012 minutes which revealed the Fed had been short volatility…the release of the minutes was confirmation (at least for me) that the Fed had unloaded their short volatility position…further, SVXY was in the 130’s…UVXY was in the 8’s…however, Proshares DID NOT announce splits…that is important! interesting fractal…let’s see how it plays out!